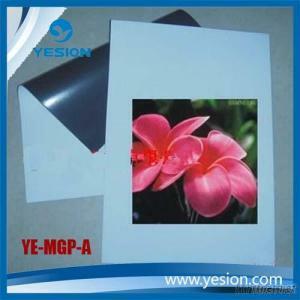 Magnetic matte paper is the new product ,it's both uv ray and water resitant,it's will keep the color prints looking vividly for a long time.the total thickness is about 0.3mm. magnetic paper is easy to cut with scissors to help you make any shape you can imagine. This exceptional paper is actually magnetic,but it still fits into your inkjet printer and prints easily,it's let you print whatever you want .Simply print it ,then cut it out into the magnet shape on your choice,Clinging easily to refrigerators,file cabinets and even car bumpers,magnetic matte paper lets you produce items as vared as your imagination allows. 3) It can be used for printing photos,pictures, etc.